Admittedly, I am not a sports fan. I played sports throughout my youth and for a period in college, but I have never enjoyed watching others play much. I am, however, often subjected to ESPN Sports Center and other radio sports programs when riding in the car with my husband, and I consistently find the racial narratives embedded in, and sometimes addressed directly in, the commentary far more interesting than the sports themselves. My introduction to Yasiel Puig is no different. As I sat listening to the litany of complaints against this young, Cuban-American, Los Angeles Dodgers rookie, I stopped planning out how to successfully put all three of my kids to bed early that evening, and I began listening to ESPN’s coverage of all the drama that apparently erupted only one month after his MLB debut. Basically, the media and a fair share of MLB opponents have complained that Puig won’t play by their rules: he has not shown reverence to league giants; he will not make his private life public; he has an arrogant “swagger” on and off the field; and he has used his interpreter to try to pick up women. Both his fans and teammates, however, seem to have few complaints and lots of adoration. I interpreted all of this as the media wanting a “salvation” story—wanting to know that the U.S., who has had an imperialist relationship with Cuba, has saved a poor, black Cuban from socialism and allowed him to experience capitalism. The insistence by the media on being able to tell Puig’s story, or to usurp his self-pimping for their own benefit, produces a troubling, yet all too familiar race narrative. In his debut month, Puig batted .436 with seven home runs and 16 RBIs, with no debut being so prolific since Joe DiMaggio in 1936. The media has subsequently complained about Puig’s insistence on keeping his private life and past separate from his public life as a rising baseball star. Various MLB players, including the Arizona Diamondback’s, Miguel Montero, have complained that Puig is arrogant and needs to be more humble and respect the game, which Montero emphasizes when he claims Puig creates a bad reputation around the league by going out there with all that “swagger” and “making people want to crush him.” Fans, on the other hand, generally seem much more concerned about the athletic performance of No. 66 and feel an intimacy with him through his athleticism rather than through a personal narrative of struggle and determination. In response to the criticism, Puig has largely remained silent. He has not invited Oprah to convene a special show for him to breakdown and sob, telling a story of a poor black boy trying to repeatedly defect from Cuba. Instead, he has said he no longer pays attention to what the press writes, and that he does not like the press. In a July 7, 2013 interview, he bluntly states, "I don't like to be interviewed so often, because the accomplishments are not just mine but the whole team's. It's nine of us giving our best on the field, and my teammates also deserve to be asked questions." It is interesting that his opponents find someone who emphasizes the sport being a team sport and shirking individual recognition to be arrogant. At this point, no one can say for certain whether Puig’s performance will sustain and grow, or if it will fizzle. What can be said, however, is that even without mentioning Puig’s Afro-Cuban ethnicity, a narrative of race and nation is festering in the media coverage of this phenom. Unlike the initial wave of fair-skinned, or “white,” middle and upper middle class defectors who fled Cuba after the Cuban Revolution and Fidel Castro displaced Fulgencio Batista, Puig represents the dually oppressed black population whose disproportionate representation in the Cuban refugee and emigrant population in the U.S. was staggeringly low until the 1980 Mariel boatlift. Once a critical mass of Afro-Cubans did begin arriving in the U.S., they often did not have the social capital of the first and second wave of primarily “white” immigrants, and their identifiable blackness made them unwelcome in established Cuban communities in the U.S. and especially in Miami. Furthermore, the fact that they were not allotted the same residential status and Federal benefits as the previous two waves of immigrants created serious economic, social, and political challenges for the high number of black Cubans arriving in 1980. 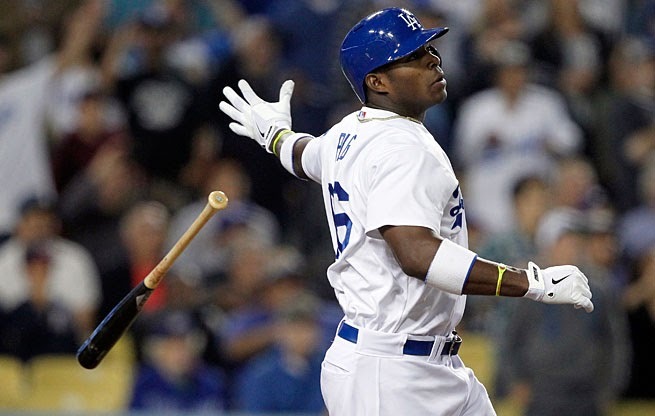 This history seems to inform perceptions of how Puig should and should not interact with the media, and ultimately, how he ought to perform gratitude for being saved from a life that, while as a player on a Cuban national baseball team was more comfortable than that of the average Cuban, is nothing compared to his life in the U.S. The racial undertones of the coverage of Puig’s debut are poignantly summarized in a USA Today article, describing Puig as, “a burgeoning legend without a past.” As a population who dominates in number—depending on how you define “white”—Afro-Cubans are under-represented in the Cuban government and have virtually no presence in higher education institutions. Although an African heritage heavily informs Cuban culture, that African past and the black and mixed-race population produced by it are largely written out of the national narrative both in Cuba and the United States. I doubt, however, that the media pesters Puig for his story because they want to participate in recovering an obscured African past, which could be why Puig drives his white Rolls Royce, conjuring Don Omar’s “How We Roll,” as his silence and curt responses, or as Montero labels it, “swagger,” insinuate: “And we do it how we do it whether it's now or it's later/And we always handle business cause we bout gettin this paper/What you want, what you need…” Puig is just handling his business, and I, for one, do not begrudge him his privacy. Simone Drake is an assistant professor of African American and African Studies at The Ohio State University. Her research interests are broad and interdisciplinary, focusing on: critical race, gender, and legal studies; transnational black feminism; black masculinities; visual and popular culture; and the literature of the African Diaspora in the Americas. Many of these research areas intersect in Drake’s forthcoming Transnational Negotiations: Critical Appropriations in Black Women’s Cultural Productions (LSU Press), and in her second project, When We Imagine Grace: Black Men and Subject Making.